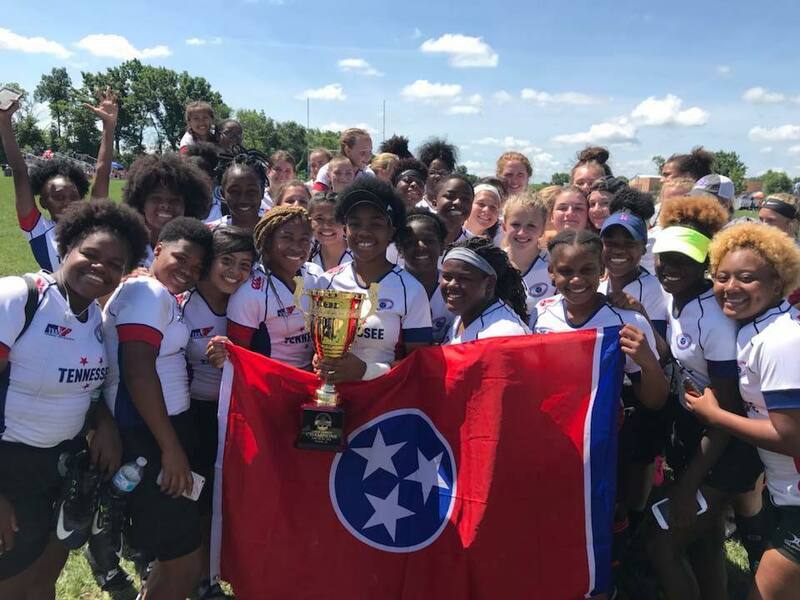 You read that correctly- Tennessee achieved a clean sweep of 1st place hardware in USA Rugby’s Regional Cup Tournament (RCT) series. USA Rugby describes the annual RCT as the competitive entry point for any high school student hoping to make a run at the pathway to the Olympics, USA Eagles, or pro rugby. With these monumental victories we anticipate those pathways becoming even more accessible for our students and alums. MICR student-athletes teamed up with their usual opponents across Tennessee to form the Champion Tri Stars squads. From Germantown, to Ravenwood, to Brentwood to Columbia- the best in Tennessee bound together for the 1st place effort. The girls- under the leadership of Dan LaFond, (Columbia) Heidi Whitman, (Germantown) Steph Kunz, (Germantown) & Emma Knapp (MICR) went undefeated in the varsity bracket - turning heads with lopsided scores and explosive offense. The boys - led by Jason Richards, (CBHS/West TN) Mark Williams, (Ravenwood/USA South) & Tee Neely (MICR) suffered only one loss to South Carolina before pushing through to win the whole tournament. MICR’s mission is not to win rugby games. We strive to expand opportunities for our students and we use rugby as a foundational tool to realize our mission. Thanks to the leaders above - and the determination of our students and families - we are driven to leverage this experience for even more opportunities moving forward. Congratulations to the Tennessee Tri Stars- especially the names below from MICR! Conversely, two of our best players decided to take their sophomore year 7’s season off in order to work and make some money. I told them I understood their decision but knew it would dramatically affect the team potential and morale. That 15’s season they said they were going to juggle both work and rugby. About two weeks in both their bosses said they were needed more at work so they had to choose- rugby or work. Telling me their stories, they laughed and said it wasn’t even an option. They couldn’t miss out on any more memories with their team and they have the rest of their lives to work. They’re now both playing at the college level, one receiving a rugby scholarship. RECRUITMENT of players will prove to be a different challenge for each school and coach. Multiple factors play into ease of the recruitment process including proximity, active recruitment, passive recruitment, and use of stakeholders. Attend or Chaperone school events your players intend to participate in or are excited about: talent shows, track meets, volleyball games, school dances, dance performances, etc. RECRUITMENT itself will differ by school, program, and coach. Despite this fact, both active recruitment and passive recruitment are valuable methods to maximize the number of students we get to participate in rugby and thereby impacting with rugby. ACTIVE RECRUITMENT consists of the coach visibly promoting rugby as an opportunity, discussing playing opportunities with players, and pursuing players. Visibly is perhaps the most important word- as it serves to build proximity, show the coaches investment in the program, and start to build presence (discussed later). Should be done at a mandatory grade or homeroom time to maximize engagement with message. Should be short yet powerful- ask for only 5 minutes. Rugby looks for all types of players and body types– bigger slower players who are strong, tall or short incredibly quick players, etc. We have had people who have never played a sport become incredible players! Smile be happy, be excited, be genuine, bring “razzle and dazzle” and build excitement! SELL IT! 1. Coach holds before/after school announcement instead of during mandatory time: Students are late to school, and students leave early. In addition- a majority of students simply won’t show up and ever get to be excited about the message because they never heard the message! It is impossible to build excitement when only 4 students show up for the team meeting after school, but by making it during a mandatory school time allows you to engage the largest possible audience including those who didn’t know they wanted to play rugby until they heard you speak. 2. Coach uses announcements to publicize team and announce it: Students don’t listen to announcements. I didn’t even listen to them all the time! Intercom/school Announcements are an incredibly deflating way to announce anything. Recruitment will fall flat if this is one of the first ways you pub the team. In addition, you do not establish any proximity, cannot sell the opportunity, engage only in a small fraction of your potential audience, and set a poor precedent for how you plan to communicate with your team before it comes into existence. After the widespread-announcement, you can begin with passive recruitment which is recruitment done without the coaches vocal or visible presence. This can be done by putting color flyers up with examples of current players, asking teachers to publicize the team in class announcements, appropriate use of announcements, asking players to recruit friends and classmates, facebook posts, players snapchat advertisements, posters, and more. You don’t want to abuse any of these methods, but instead use a wide-array (if not all) of the above methods with quality photos, messages, and hooks. This should be done literally the afternoon after the first-widespread announcement for at least a week leading to the first practice or try-out. Along with the passive recruitment methods, a coach should concurrently use the two next methods of active recruitment: in-person conversations and recommended-calls, but WHO do you engage with? The answer simply involves listening! Two of your three most valuable resources for players will be current players and other coaches. Current players will often tell you who is the most athletic in the school or who they believe has the most potential, but they also can inform you about friends who are considering and you can discuss with more. Other coaches are integral to team success both culturally and recruitment- so framing for recruitment sounds different. I’m looking for any player- but can you recommend me a couple of your players who may not be an all-star but tries hard and is always trying to improve? I’d love to see how rugby can help them become a better player and student. Do you have any players who are off during the spring but you want to keep in shape? We would love to give them a fun way to stay in shape and stay ready for X season. Do you mind if I come after practice and talk to your girls about the coming rugby season? I know the season is winding down and some are interested- if we can keep them busy, keep them in shape, and make them better athletes I’d love to work together on it. Lastly, the third, and often overlooked, source of players is teachers and admin. Coaches and players alike both want the best players so the team can reach its full potential which is, in a way, a bit of a selfish motivation. Teachers and admin are third parties which have little to gain from a student playing rugby, therefore their recommendation or suggesting of a student is, implicitly, understood to genuinely be in a good interest of the student with no ulterior motives! It’s worth noting, however, that we’ve had a multitude of students referred to us from reasons like “they need something to motivate then” to “they need something to motivate their academics”. Also, by asking teachers and administrators for students who could help build a culturally strong team (as opposed to just the “best athletes”) helps build rapport with faculty- showing them you are invested not just in making a good team, but also making an academically and behaviorally sound team. What is said to a potential player is just as important as finding the player however. The conversation, whether a phone call or in-person, should always begin with why you are discussing rugby with them (Mr. Albano recommended you, Terrence said you were interested, Dr. Brown said he thinks you’d be a great player, Coach Lopez said you would probably love rugby). This brings in a third party and opinion outside of just you (clearly on the yes side) and them (thinking about it, certainly playing, not interested, etc.). After this, the conversation will be driven by their level of interest. Stay tuned for the next chapter of this blog series for examples and guidelines of how the conversation should go after gauging interest! Thanks for reading and for #ChangingTheGame.